Show your friends and loved ones how much you care with custom made gift tags. Create one in minutes with a little help from Canva. Customized gift tags add that extra sparkle to any gifts you plan to shower on friends and family for the holidays, birthdays or anniversaries. Personalize them with your favourite colors and artwork so your gifts truly stand out while spreading holiday cheer! Canva makes it easy to create stunning, original gift tags for your friends and loved ones. Everything you need is at your fingertips. Canva is designed to be intuitive and fun to use. Drag and drop the elements you want to use onto your canvas and customize the size and text with the click of a button. 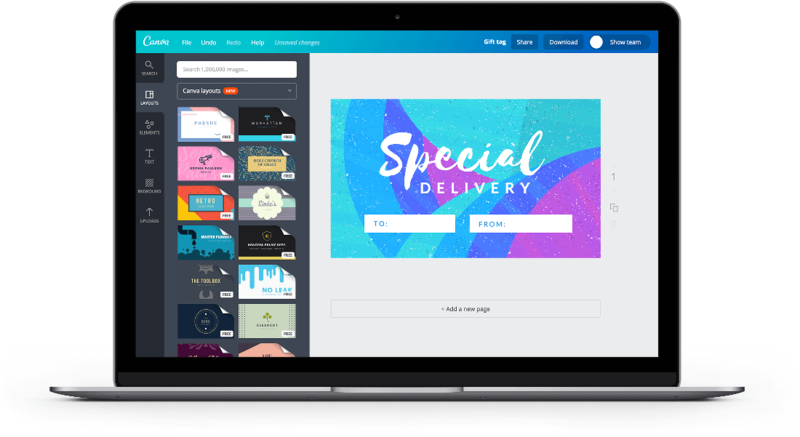 Create a new Canva account to get started with your own Gift Tag design. Choose from our library of beautifully designed templates. Choose from the many free design elements you can find on Canva. Click “Elements” and choose lines, illustrations, shapes and icons to add to your gift tag. Each photo or illustration is carefully reviewed and curated so your gift tag designs are sure to look great whether printed or shared online. Don’t like the colors? No problem. You can change the colors to suit your gift tag. Stack imagers or other design elements by clicking “Arrange” and move text to the front of the image. Write your message using beautiful typography by taking advantage of Canva’s textholder tool. Textholders are little sets of elegantly paired fonts you can simply drag and drop into your design. You can even create your own by using Canva’s free-form text tools. Choose from over a hundred different fonts, change up the color and sizes and drag it to where your message will best shine. When your gift tags are ready to print, choose between PDF, highres JPEG or PNG files. You’ll get crisp, clear and colourful gift tags you will be proud to share. You can also share your gift tags online. Attach them to emails or post on your favorite social media site. That’s part of the beauty of using Canva. It gives you so many ways to share your creations. How can I access Canva? You can access Canva on the web by going to www.canva.com or by downloading our free iOS and Android apps from the App Store and Google Play. Can I make multiple Gift Tags? Yes, you can! Simply click on the duplicate icon to the right of each design and it’ll be replicated. Once that’s done, simply click on the name and message field and change it for every consecutive gift tag. If you’re feeling creative, you could even personalize each tag with your friend or loved one’s favorite color. Can I collaborate with my friends or family on my design? You sure can. To allow a friend or family member to edit your gift tag, tick the box next to “Share/email as an editable design”. This will give them access to edit your design in their personal Canva account.